Palmira, Syria. Ruins of an old city. II thousand years BC. The Pearl of Syria. A landscape with a camel. Museum’s collection includes documents, burial reliefs and a tariff slab. The State Hermitage museum in St. Petersburg is collecting its materials about the antiquities of Palmyra to aid in the future reconstruction of monuments at the UNESCO-protected site in Syria that have been demolished by terrorists, the museum’s director Mikhail Piotrovsky told the Rossiya-24 TV channel on Dec. 14. “At the moment we are gathering all our materials and documents devoted to these monuments. When everything calms down, they will have to restore the monuments as we did with the ruined suburbs of St. Petersburg,” said Piotrovsky. The Hermitage’s Palmyra collection includes 10 burial reliefs, several sculptural fragments, a large slab with texts recording customs tariffs in Greek and Aramaic, and some coins. “The famous Palmyrian Tariff would not exist now if it had not been given to the Hermitage museum some time ago,” said Piotrovsky. According to him, the museum may organize exhibitions of the showpieces from Palmyra. Palmyra, located in the Syrian desert between Damascus and Euphrates, was one of the richest cities of late antiquity. According to the Hebrew Bible, Palmyra was founded by King Solomon of Israel. 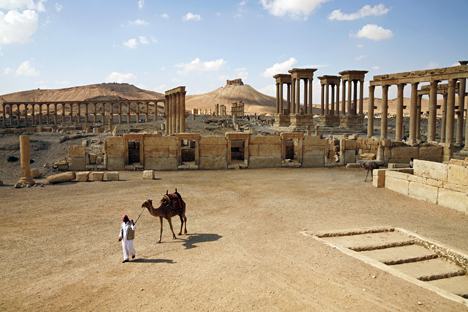 UNESCO has declared the remains of Palmyra a world cultural heritage site. Islamic State militants seized the city on May 20 and ruined several ancient monuments, including the 2,000-year old Lion of Al-lat statue, the Temple of Baalshamin, built during Roman rule in the 1st century AD, and the Temple of Bel, the biggest building in the city, which was erected during the reign of Emperor Tiberius in 32 AD. The terrorists also beheaded 80-year-old Dr. Khaled al-Asaad, one of the most famous Syrian archaeologists, who devoted his whole life to the studies of the ancient city’s heritage.